The extruder is a thermoplastic processing tool that can be used to make fibers, hoses, cords and tethers out of a host of polymers. As one of the early polycraft inventories, the extruder is on the critical path toward an oil derrick, because it is necessary to make the hoses that go into it. 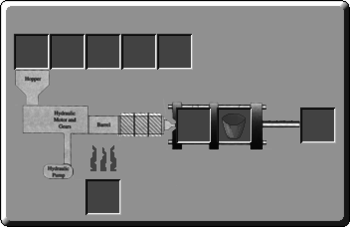 This shows a picture of an automated Extruder that is outfitted with 3 Pumps and 2 Pipes and three simple levers. As you can imagine, the flow networks that automate inventories like extruders can become much more complex. In this case, you want to be able to turn the pumps on and off so as not to waste fuel. You could imagine a timer circuit here for ultimate efficiency coupled with fuel savings. This page was last modified on 28 August 2018, at 02:10. This page has been accessed 17,488 times.